Abstract Orchestra return to Band on the Wall to perform the work of seminal hip-hop producer MF Doom! 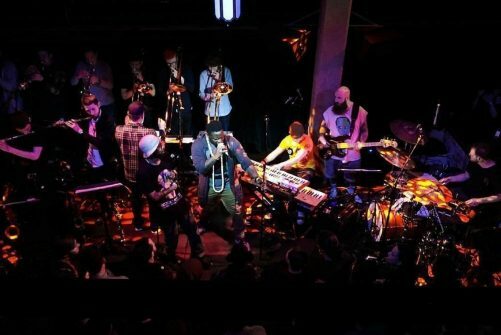 Abstract Orchestra is making some of the most exciting music in hip-hop, blending jazz orchestration with hip-hop beats and MC’s. The 18-piece all-star big band creates unique music that is both heavy and beautiful, pushing the boundaries of live hip-hop. The band includes musicians that have toured with some of the top acts in the world including Jamiroquai, Corinne Bailey Rae, Mark Ronson, Amy Winehouse, John Legend & The Roots, Roots Manuva, Adele, Estelle and Lily Allen. Along with their original work, Abstract Orchestra is well known for their masterful reinterpretations of hip-hop legends that include J Dilla and Madvillain, diversifying ways in which hip-hop can be enjoyed.